Types of lamps and things to consider when choosing lamps for your home. The various types, along with the style of lamp that you choose can change the look of an entire room as well as improve the lighting. Lamps are chosen according to function, such as a desk lamp, or as a decorative accent piece which could be a table lamp. There are various things to consider when picking the right lamp. Consider how bright you want the light to shine.There are floor lamps that come with adjustable settings. You can find a lamp that requires 3-way bulbs so you can change the brightness of your lamp. If you only require 1 setting, select a lamp that will hold a bulb with the acceptable amount of watts for the space you are planning to keep the floor lamp. Light bulb choices range from LED, Halgen and the traditional light bulbs which include the 3-way bulbs. You will also want to consider whether or not that you want touch style, a clapper, or one with a switch, Your light bulb choice will depend on your lamp choice and what it requires. Determine in which direction you want the floor lamp to shine. The type of lamp you buy will depend on where you want to send the light. Torchiere lamps send light directly upwards. Shade lighting directs the light out from the shade and down towards the floor. There are also floor lamps that do both, and adjustable lamps that can send the light in different directions. Your floor lamps will more than likely be those that are used in the corner of a room, or maybe near someone who has a special spot for reading and needs direct light on their reading material. 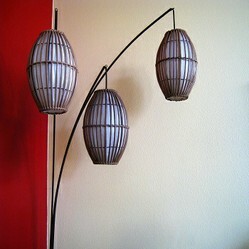 Essentially, floor lamps are stand-alone lamps. They are best used in an area where a small child cannot knock them over. Floor lamps work great in a corner space near the entrance of a room making it easy for someone who is walking into a dark room to have immediate access to a light source. Another area which may be used for a floor lamp is near a bookcase or any location where lighting may be needed, when overhead lighting may be a bit too much. Floor lamps are perfect for the computer user, especially when it or the lamp(s) are adjustable, which will eliminate the glare that is often experienced with overhead lighting. A Torchiere lamp is an example of one style of floor lamps. The easiest way to describe a Torchiere lamp is that it is a floor lamp with one or more shades that look as though they are bowl shaped, or upside down; allowing the light to shine towards the ceiling through the open top, much like a flame would come out of a torch. Pole Lamps: If you are looking for a classic look, you may want to consider pole lamps that have a cloth shade, or globe on top of it. These lamps typically have one bulb and may provide adjustable switches. Tree Floor Lamp: This type of lamp is much like a pole lamp except for it having several light sockets branching off from a single pole which allows the light to be focused in multiple directions. Some of these lamps have flexible arms that allow you to move them in different directions, while others are stationary. Arch Lamps are great task-reading lamps. Typically, they are on a curved pole allowing you to focus your light source on your reading material or crafting project. Make sure your arch style lamp has flexible arms so that you can change the direction of your lighting. Table lamps are not only used in the main living area. Although you find table lamps in the bedroom, they are smaller because they come in a variety of heights and widths. Table lamps, on average, range from 25" to 32" tall. The widths range from vary narrow to wide. The base may be narrow, while the decorative body is much wider. The recommendation is to use short lamps on high tables or stands, and use the taller lamps on shorter tables/stands. Slender lamps look good on an accent table because it won't overpower the table, therefore, it will be more aesthetically appealing. Also, a larger lamp on a smaller surface may very well fall off. Desk lamps are often thought to be those movable metal lamps. Today, with home offices, a desk lamp has become part of the décor. Desk lamps are also called “study lamps.” They are similar to table lamps, but the main difference is that they are considered to be functional rather than decorative. Desk lamps are used to provide sufficient lighting while someone is at their desk performing various tasks. Experiment with different lamp shades on your lamp choices. Lamp Shades come in a variety of fabrics, colors, and patterns. Be sure the lamp shade covers the bulb. This will reduce glare when you are near it. The type of material, as well as color will have an effect on the amount of lighting that it will provide. If you choose the wrong shade, you will end up using high wattage bulbs. If your walls are painted with dark colors they will absorb light. Look for lamps with extra wattage, especially floor lamps. Again, the right shade will allow you to use bulbs that are less wattage amounts.